Today’s MSN conversation between LindaJ and I started off innocent enough–as all our conversations seem to do. No one could be labelled the instigator, and no one was leading someone else astray. BTW, that is our story and we are sticking to it! :) Back to the conversation….Linda was telling me about her guild meeting today–some show and tell, but most of it relating to the program. I asked what today’s program was about and Linda replied, Stack’N Whack. Apparently, Linda’s guild is going to be doing a class on making Stack’N Whack fans at their next sew in later in February. Then Linda mentioned that she won’t be doing the class. She said she already has a hexagon Stack’N Whack project that is an old UFO. Linda: Do you know where your project is? Me: Oh yes. Safe and sound in a box. Linda: I have a pretty good idea where mire is too although it has moved over the years. Me: What size is your project going to be? Me: OK, that does it – we both need to move these projects on. Me: I didn’t remember I had one, you aren’t sure about the details about yours. And so it always starts–from a small spark in a conversation. Before we know it, we have plans for the next project. We keep each other motivated and on track to completion. We are also responsible for creating a few new UFO’s along the way. But given that UFO’s are a part of this creative process, this should not be a surprise. We both have way more ideas about what quilts we want to make than we have time to finish them. We both agreed that we would document something about our UFO hexi’s so here is the detail about mine. Stack’N Whack table topper belonging to my Mother. 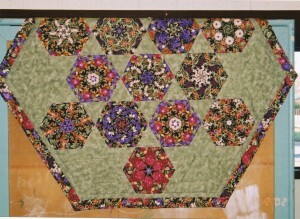 This first picture is a photo of the hexagon Stack’N Whack table topper that I made for my Mother and gifted to her years ago. (circa 2003) I had enough fabric at the time to make myself a matching table topper, but I only finished the one topper for my mother. 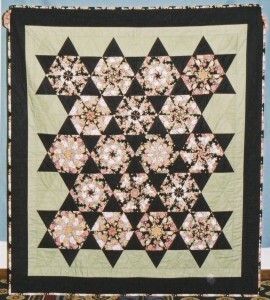 On November 2, 2002, I took a class from Betty F. (a member of the same quilt guild as me). 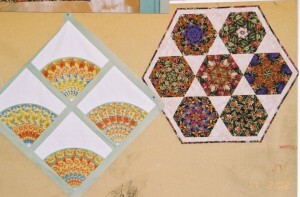 Betty brought along some great class samples and I remember falling in love with the hexagon shaped blocks made into a hexagon table topper. I stored that idea away for later. My Stack’N Whack quilt from the November 2, 2002 class sponsored by our Guild. This was the project that I started in that class and later finished and gifted (along with the rest of my family members) to a cousin’s daughter’s wedding in early 2003. My Stack’N Whack fabric before cutting. After finishing the lap size hexagon Stack’N Whack project, I pondered the possibility of kaleidoscope designs in almost every fabric I saw. After Christmas in 2002, the Christmas fabrics went on sale and I picked up this yardage. The colours were not what I thought traditional Christmas colours were and I knew if you cut the fabric up, you would not be able to recognize most of the Christmas elements of the fabric. Once this fabric is cut into pieces it reminds me more of the Mexican inspired pottery I have seen in the southern U.S. states, rather than Christmas. 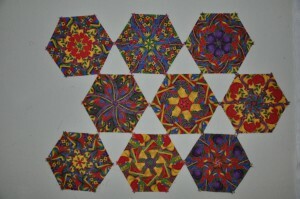 My UFO box contained these 9 completed blocks and a stack of triangles cut for another 8 blocks. I also had some purple fabric in there. I must have considered a purple background for these blocks at one point, although, a black background won out in the project I completed for my mother. So, it would appear that this hexagon Stack’N Whack table topper will be the next project in the queue. Since this particular project only needs 7 blocks, I am not sure what will happen with the leftover blocks. I also have quite a bit of that yardage left. So, I may have more than one project left here to make. We will have to see where this ends up taking me. This is the quilt that I gave my Mom this year for Christmas. As promised, this is a better picture of the quilt–now in its new home, in the spare room of my parents’ house. Ignore the topper on the table in the corner. That topper is on its way out and will be replaced with an all white one. This is a picture of my husband with the fish quilt that I made him. Although this quilt was finished in time for Christmas this year, this was not a Christmas gift (not this year anyway–LOL). Several years ago, I gave my husband a completed block for this quilt as part of his Christmas present that year with a promise to finish the quilt after Christmas. 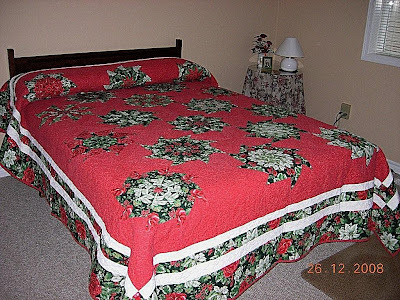 I guess I should have specified which Christmas because here we are several years later and the quilt is now finished. No more cold knees for my husband, Pam ! This is the Christmas quilt that I finished for my mother for this Christmas. The flimsy was finished in September 2006 (http://silverthimblequilting.blogspot.com/2006/09/stackn-whack-christmas-completed-to.html) and this top sat in the “to be quilted pile” since then. As Linda pointed out, “It isn’t doing anyone much good sitting in a bin somewhere”, so out it came and I finished it in time for this Christmas. 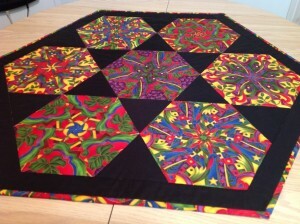 My mom has promised to provide a better picture of the quilt once it is in place on her bed. The following three pictures are of some of the Christmas vignettes from around our house. Notice the totally green poinsettia? This is a plant that my husband brought home from work. He tried to tell me this was a new variety of poinsettia. Turns out that this plant didn’t receive the appropriate amount of light and dark to trigger some of the leaves to turn red. At first I thought it looks a little odd, but the longer it lives in my dining room, the more it grows on me. I think it fits with the red and green theme going on in the dining room at this time of year. This is my nativity set–all white porcelain. I was thinking I didn’t have room to properly display it. After rearranging some things in the kitchen, I found a great place to display it on the corner of the kitchen counter. This is this year’s tree. As you can see, we weren’t shorted in the present department. There were plenty of things under that tree for all of us! This is my son and his girlfriend. This is Joey checking out the presents before all the unwrapping activity started. I think he smelled the catnip mouse that was under the tree for him. These are the stockings–overflowing with stuffers before they were opened. This is my son, his girlfriend and my daughter sitting on the couch at the beginning of the present opening phase of the morning. This is my daughter and husband playing Santa as they distribute the presents to everyone. This picture was taken a little further into the unwrapping frenzy. Paper, paper everywhere. We saved the presentation of the quilt for my mom for last so we could all watch her open it. We have experienced a higher than normal amount of snowfall in the past week. It started snowing again on Tuesday night and it never stopped until we got up Thursday morning. The next three pictures were taken Wednesday (Christmas Eve Day). These pictures are of my son shoveling the driveway. The last seven pictures were taken around our yard and show the recent snow accumulations. This is the first white Christmas coast to coast in Canada since 1971!